Sometimes you find the next thing you’re meant to fall in love with completely by accident. In late 2011, a venue that seemed to be the only one in the area to draw any of the bands that my husband, Steve, and I actually want to pay money to see shut down due to a classic dispute between owners. The Southgate House split in two; one of the owners reinvented the historic Newport home Southgate House as the Thompson House, and the other owner cleverly transformed a beautiful, old church building in to the Southgate House Revival. So far the two venues have truly been like two halves of a split personality, with Southgate House Revival continuing to draw many of the alternative folk, punk, and bluegrass groups that we once sought out at the original Southgate House, and Thompson drawing bands that can range from questionable (Trapt) to fantastic (Bad Books featuring Kevin Devine). Steve and I were scrolling through the list of upcoming shows at Southgate House Revival when I saw the name Shovels & Rope. I had a nagging feeling I’d once told myself to look them up after hearing a song I liked on local radio station WNKU, so I switched over to YouTube and typed their name in the search bar. Steve and I are both pretty set in our musical tastes and band preferences – open to new bands but rarely finding one to get excited about. We’re both the kind of people that seek out new or reissued releases from groups we already like versus searching for the fresh or unknown. I couldn’t even write a “best of 2012″ list this past new year, because the only things I bought were releases from First Aid Kit, Tegan and Sara, and Tilly & the Wall, and being the only albums I bought certainly doesn’t make those the best releases of 2012. However, we’re both music lovers, and the hope is always alive that there are new, wonderful songs to discover. 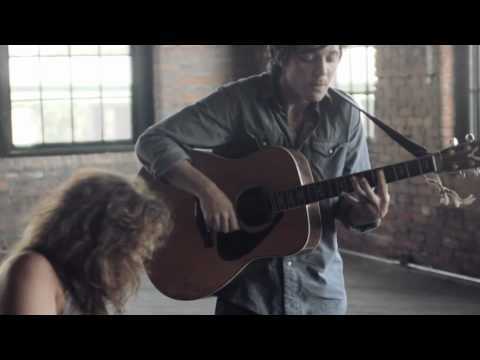 Thus, when we began watching the first Shovels & Rope video that a YouTube search produced, we were pleasantly surprised. Extremely, pleasantly, surprised. They. Were. Fantastic. 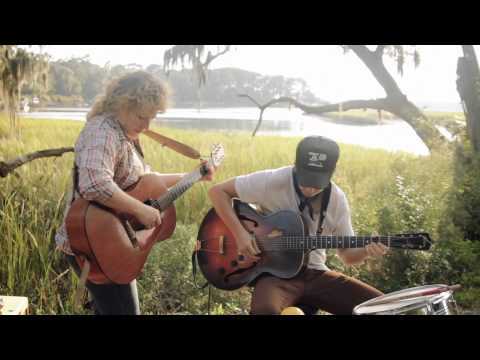 We watched the entire video for “Gasoline” in a stunned silence, a buzz of excitement palpable in the space between us as we watched the two members, Michael Trent and Cary Ann Hearst, flawlessly play a raucous tune under a tree. I clicked on another video, and another, and another. We listened to Shovels & Rope’s toe tapping, rebel-with-a-heart country the rest of the night. We smiled watching the obviously in love (and married!) duo croon to each other in the melancholy ballad “Lay Low.” We laughed watching the two shout at each other in the rowdy call and response song “Tell the Truth,” and I danced around in the kitchen while a video of their album’s title track “O’ Be Joyful” played. The night ended in exclamations of future plans to start a husband and wife band of our own. 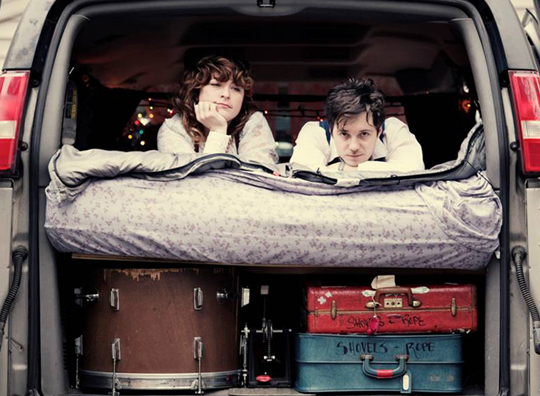 Hearing Shovels & Rope is delightful in its own right, but watching the duo is even better. There’s just something utterly charming about them, and that’s why I think this post will be lost in an amorous sea of thousands after their performance on the Late Show with David Letterman airs on Wednesday, Jan. 30th. I’m not bitter, though, about their surely forthcoming notoriety. If a rude businesswoman asks me if I’ve ever heard of Shovels & Rope, I won’t even let it get to me (read: like that time I got all uptight about Mumford & Sons). The Letterman performance will kick off a two week sweep of the Southeastern US for Shovels & Rope, including a stop at Newport’s Southgate House Revival on Feb. 5th. You can keep up with Cary and Michael – which I highly suggest you do! – at www.shovelsandrope.com.